Halloween look #2 – The Geisha. This is a fun look that doesn’t require a single teleport or a single Linden. Simply click the marketplace links in the style card, buy for 0L, and dress. Most of the items are copy/mod so can have fun putting your unique signature on the ensemble. 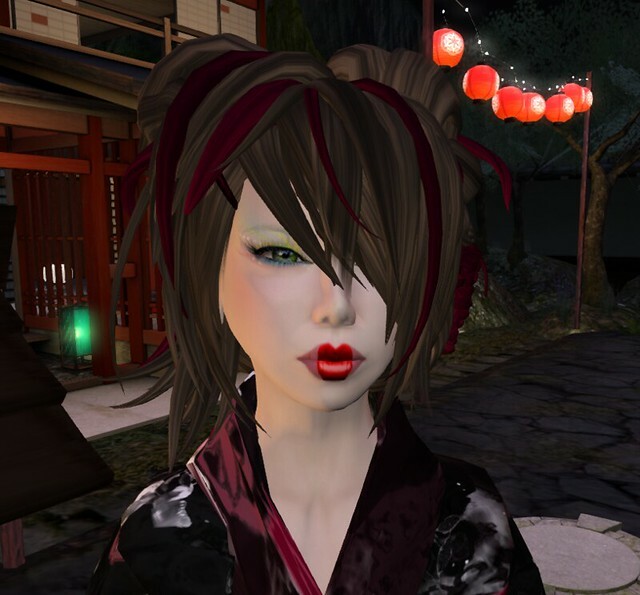 The Curious Kitties Shop supplied the Kimono & hair. We did modify the hair a bit. First we made the flexi bits invisible. Then we added the wine streaks to jazz up the design. Next we removed the peachy hue from the orchids. To create the Geisha powdered skin tone we added a skin tint tattoo layer. Then we layered eyeshadow, eyeliner, and lipstick tattoos. 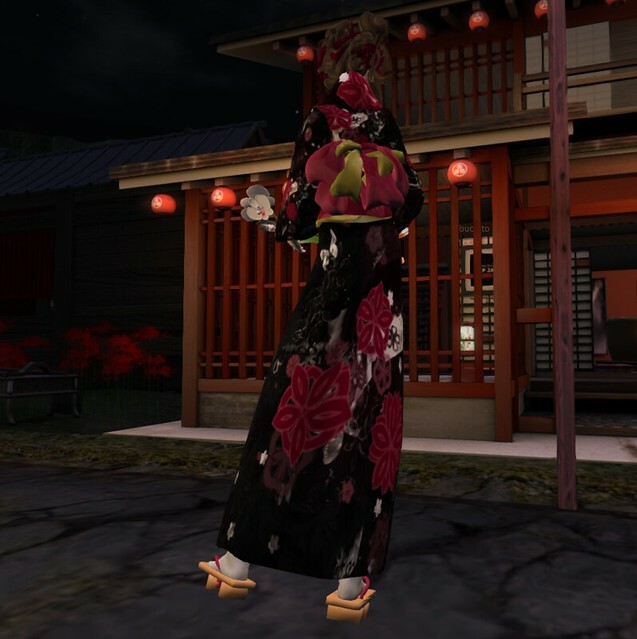 The overall effect created a lovely Geisha look without having to purchase a new specialty skin. When recreating this makeup be sure to add the lipstick last. Here’s a closeup of streaks. We added that same wine hue to the sandal straps. Now let’s talk socks. These socks are rigged and full perm. So if you want to work on them you’ll need to rez them on the ground, make your modifications, take them back into inventory and then wear them. Since the sock mesh is high above the ankle, the socks were showing through the kimono whenever our model moved. To solve that problem we added more alpha to the sock texture hiding the top half of the sock mesh. It worked like a charm. Our texture is available at the All Spiffed Up Headquarters. Halloween is coming… YIKES! Whether you are new to SL or a seasoned pro one thing holds true: You can never have enough costumes in your virtual closet. To help you never get caught in the same outfit twice, team All Spiffed Up is dedicating this weekend to rounding out your spooky wardrobe. Our first offering is Drac’s Layla Blue Leopard Dress. It comes sized to fit most mesh bodies and includes an alpha layer for classic avatars. Drac is currently running a store wide Halloween hunt. There are 20 free hunt gifts to be found. The hunt objects are relatively easy to find, so you are guaranteed to leave the sim happy and laden down with boxes to open. Drac is a large store with lots of merchandise. In addition to the hunt items there are several random freebies dotted around the premises. Best of all, Drac’s upper level has a games room where you can chill while challenging your bestie to a round of Greedy Greedy. The lovely fur is a gift from Indyra found at the current Tres Chic event. Gemma’s eyes are a wearable demo/gift from Mayfly. When Gemma came over for the photo shoot we immediately thought of a grown up Pebbles from the Flintstones. So, to round off the outfit team All Spiffed Up meshed up a set of rock jewely exclusively for our readers. We’ve made the set copy/mod so you can resize and recolor to fit your specific needs. The Yabba Dabba Jewelry Set is available at the All Spiffed Up Headquarters. Topping off today’s look is a fun and versatile hair from Olive. The HUD driven Wendy hair is currently one of the store’s Lucky Board offerings. It comes rigged and non-rigged with HUDs to control hair and scrunchie colors. Thanks Olive, we love it! So many leaves, so little time! Of course, in Second Life Fall cleanup is snap, which allows us the freedom to shop until we drop. Today we ventured forth into SL and discovered three, new to us, shops with some very nice freebies. Our first stop was Le’La Design. The shop is huge, filled with goodies, and best of all has lots of group gifts. Our model is wearing the Pin-Up outfit gift for MLM members. This is a wonderful gift that consists of the cropped blouse and jeans. Pin-up is mesh and comes sized to fit most mesh bodies along with 5 standard sizes and an alpha for classic avatars. **NOTE: Pin-up does not fit the TMP Beta Free Body. If you’re not a member of these groups, no worries you can join while in Le’La Design. Still want more freebies? Le’La also has 10 Lucky Letter Boards. With all of those options you’re bound to find something special. !! Firelight !! Satelite Store supplied today’s hair. It comes rigged and unrigged with a 12 color HUD. There are currently 4 group gifts, all completely free, and also several Lucky Chairs. Our shopping trip concluded at Valekoer where we found these great sneakers. These sneakers are a must have! The HUD allows for all kinds of fun customization. You simply select the area of the shoe you want to color then select the color to apply. These sneakers got even more exciting when we saw the meshes included in the gift box. They come sized to fit Matreya, Slink (male & female), TMP (male & female), and unrigged for everyone else. Free socks with another of one those wonderful HUDS are also available. Thank you Valekoer for the fabulous gifts! Deer Park in Autumn is a lovely little slice of the season. It’s quiet with plenty to do. There are several couples activities offered along with refreshments. It’s a wonderful place to simply chill out and enjoy a little Fall color. … to a deluxe CEO Penthouse in the sky! Thanks to Elements Log Homes you can too. Just pop by their marketplace store and pickup one of their four free skyboxes. This photo shoot was staged in the 84 prim CEO Penthouse. The CEO Penthouse ambiance is great for a wide range of uses i.e. : evening weddings, cocktail parties, music venues, restaurants, and of course the odd photo shoot. Today’s blog post marks team All Spiffed Up’s first visit to NYNE. 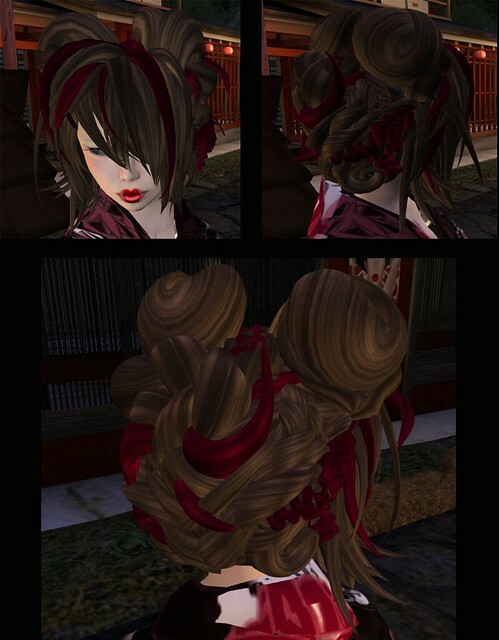 NYNE features hair, clothing, accessories, gatchas, and appliers. Best of all, their group is free to join and has a whopping 19 gifts, 18 of which are hair. Our model Cassie is wearing the dress that was included it NYNE’s clothing gift box. The shoulder dress is sized for several mesh bodies and also the standard fitmesh. NYNE thoughtfully included the dress alpha for everyone using classic avatars. So, if your looking for a new store to check out, definitely boost NYNE to the top of your weekend shopping list. The Solar Full Body tattoo is a marketplace find boxed with appliers for mesh bodies along with layers for classic avatars. A quick trip to LeLutka is guaranteed to put a smile on any hair lovers face. The Oops hair is a free wearable color demo that can be found upstairs in the older hair section. The style is nice, and the colors are wonderful. Oops is perfect for all those casual encounters you’re bound to embark on this weekend. Cassie’s skin, shape, eyes, and eyelashes can all be found in the Dulce Secrets 2017 Free Dove gift box. This box is simply AWESOME! Whether you’re new to Second Life, or simply need a fresh makeover this gift will fit the bill. Thank you Dulce Secrets for your artistry and generosity. Fingernails are always a bit of a problem for classic avatars. Before the introduction of mesh avatars several of our models parted with large wads of lindens is search of the perfect manicure. Thanks to the marketplace store Vika Design our readers don’t have to follow in our linden bleeding footsteps. These flashy nails are not only free, but also copy/mod. Once you file away an original copy for safe keeping you’re free to recolor and re-texture to your hearts content. Finishing off today’s outfit are Blackburns Angel Heels Colorable. The heels are for classic avatars, and come with a color HUD for the skin, toenails, and leather. Meow! No your eyes are not deceiving you, we’ve found yet another “hipster cat” outfit for you at FLG & No Cabide. The backless t-shirt and skirt come boxed together. They come sized to fit most of the major mesh bodies. Unfortunately, standard mesh sizes are not included. Of course, thanks to The Mesh Project the omission of standard mesh sizes and their corresponding alphas is never a problem. A quick teleport to The Shops will remedy that problem ASAP. The TMP beta free female body is always just a few clicks away. Naturally, a system body wearer can always cobble together a few alphas and pull off this ensemble fairly well. However the backless design of the t-shirt made doing that quite a challenge. In the end, it was easier for our model Gabby to simply change over to the TMP body. Today’s flowing hairstyle is a Lucky Board find from Olive Hair. It comes with a wonderful HUD loaded with terrific colors and a streak option. If you are a hair enthusiast a visit to Olive is definitely in order! All of Gabby’s jewelry is available for free in the Do Lubitsch Jewels marketplace store. Do Lubitsch Jewelry is transferable, which is great for in-world gift giving! Gabby’s sandals are still available at The Free Dove. We’ve blogged them previously so you can see the closeup pictures in the Two for the Road post. 7th Heaven home to the All Spiffed Up Headquarters and [MMc] Mr M’s Creations. Feel free to drop by our store and relax for a spell. If you’re feeling adventurous use our bicycle rezzer to tour around Zurich City.